Sacred Concerto for tenor, five Stringed instruments, and b.c. The solo concerto for tenor, strings, and basso continuo opens as a typical strophic aria with ritornello and embellished solo verses. 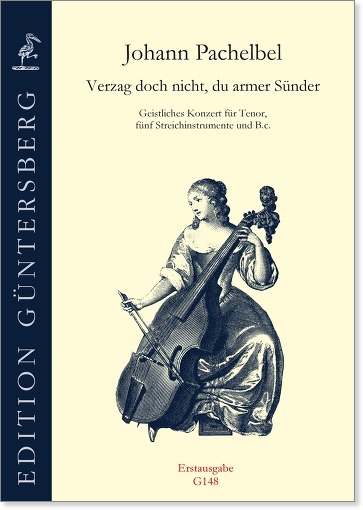 There are five string parts, whereby the first violin clearly comes to the fore as the melody-carrying voice: the “classical” string texture of the seventeenth century. However, Pachelbel does not merely reduce the strings to the function of ritornello instruments, but rather lets them accompany in various ways, sometimes in dialogue with the singer. 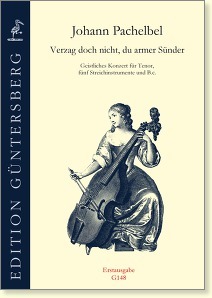 More information about possible instrumentation variants can be taken from the first page of the score which is also available in www.guentersberg.de.